Cliff Stearns, the whackadoodle Florida Republican who led Congress's investigation into Planned Parenthood and Solyndra, just received his Thank You note from voters: a primary loss to a large animal Veterinarian named (I'm not kidding) Dr. Yoho who has never held public office before and spent a fraction of money Stearns spent. If ever there was a time to wear something called "gloating pants," this would be it. This would also be the time to make the only remaining acceptable YOLO joke. Yoho. Because YOLO. Ugh. I feel dirty. 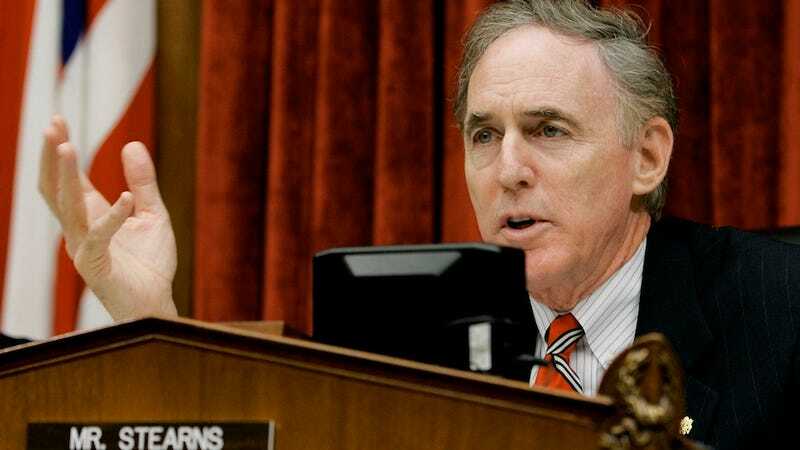 Florida held its Congressional primaries last night, and the 12-term incumbent Stearns was supposed to be a shoo-in — in fact, according to the Huffington Post, Stearns was sitting on $2 million worth of campaign cash in anticipation of toppling all of his challengers. But never underestimate the Crazy of Florida — in a race that wasn't called until just hours ago, the Tea Party challenger out-wingnutted one of Congress's stalwart wingnuts by just over 800 votes. Which means there's a new, boy version of Michele Bachmann in town! And this time, he's from Florida! Dr. Ted Yoho likely won't represent a big change from what Stearns was doing all along — he's sort of like Stearns across almost every issue, but further to the right. But a freshman congressman with whacky views holds much less power than someone who's been in office since 1989 and grown progressively whackier. It should also be noted that Stearns began investigating Planned Parenthood after Americans United for Life, an anti-abortion rights advocacy group, claimed that they found that Planned Parenthood clinics in several states were abusing Medicaid funds (a claim that none of the many audits Planned Parenthood undergoes has backed up). AUL also pressured executives of Susan G. Komen For the Cure to discontinue funding for Planned Parenthood on the grounds that Cliff Stearns was conducting that investigation that they had pushed themselves. Komen listened to AUL, and... we all know how that story ended. The puppetmaster is drunk! In addition to ousting a powerful Congressman, Dr. Yoho enters the Capitol with one of the best names in government. Comedy.